Staying on track during the recovery from a chronic illness requires faith in the Lord for sure. From there are the little strategies that keep me sane like writing in a treatment journal. 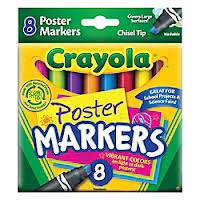 With so much going on from ever-changing meds., supplements, Rife programs, OTC remedies, nutritional strategies and the symptoms that follow, I would be lost without my handy Crayola Poster Markers! This also helps during appointments with my LLMD when he asks about the course of illness and treatment responses (or lack thereof). So there you have it. I’m on my second box of markers and the green one is running out of ink again. I thought it would be the orange marker pooping out first but it’s got the staying power I did not expect! So glad the bright pink and purple ones haven’t seen any activity for the last month. Those colors are best portrayed in my garden right now, thankfully! I got to retire the brown one a couple of months ago too. I’m sad that the blue one gets used most days and especially since physical therapy ended 2 weeks ago. I had improved and needed to use the blue and green markers less when P.T. was weekly but the insurance company doesn’t want to play nice with my Crayola buddies. Geez!